The Take the Leap theme today was 'Go Unnoticed". I am not feeling well, finally getting what everyone else in my house has had for the last three weeks and I also got some bad news from my surgeon today about my frozen shoulder. So all in all I am feeling blah and not in the mood to take photos. I am sure if I was feeling more like my normal self I would have thought about the theme more and taken a much more interesting photo. 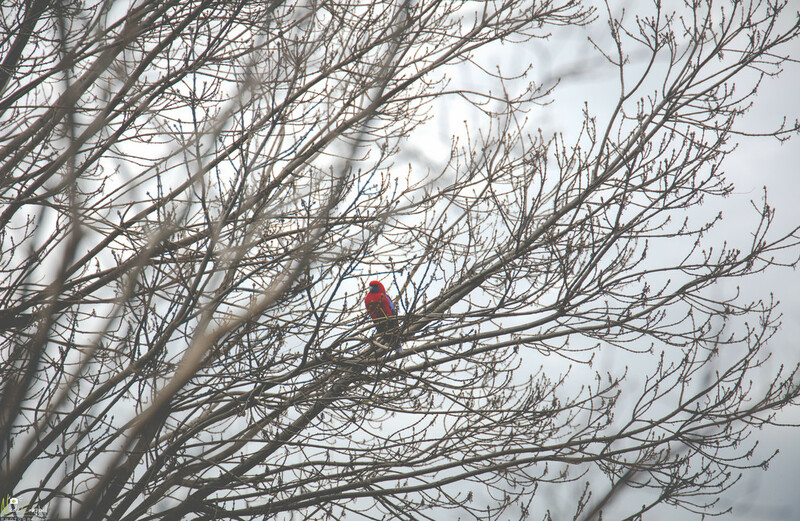 I noticed this rosella in the tree and took the photo through my kitchen window, trying to go unnoticed so it wouldn't fly away. I did go out into the back yard but as soon I approached the tree, this one and its friend, flew away. Beautiful rosella capture. Sorry to hear about the shoulder, and that the lurgy has got you too. I hope you recover quickly, and get some new options for your shoulder soon. Sorry to hear about your health...hope everything is alright. Nicely spotted. He probably doesn't know how brightly coloured he is and thinks he blends in so well. Sorry to hear you aren't too well at the moment. My husband is just recovering from pneumonia, so feeling under the weather really knocks you for six doesn't it. Hope your frozen shoulder improves too. I had a frozen shoulder a few years ago and eventually had to have cortisone injections to fix it. Fingers crossed it worked well. Wouldn't want that again. Just take it easy and hope you make a speedy recovery. Pretty bird among the branches. Sorry you're feeling off. I hope you're feeling better soon. @ltodd @alia_801 @leestevo @onewing @kwind @seattlite - thank you for your well wishes. I need to decide if I have a second operation on my shoulder. There is no guarantee that it will work. Regardless of whether it works or not, my shoulder will remain as is forever and I will never have full movement in it again. So frustrating as I can't even reach above my ear to put my hair up. I am making the side ponytail fashionable again!